BANGALORE: The Indian Space Research Organization (ISRO) is developing a technology that will allow it to transfer humans from one vehicle or spacecraft to another in space. The immediate goal is to enable refueling of spacecraft to give them a longer life and transfer other crucial systems to an existing spacecraft, by transporting another to space. Spacecraft docking will allow joining of two separate free-flying space vehicles. Another system called berthing will be used to transfer things from one vehicle to another. Confirming that experiments on the technology are being done at the ISRO Space Application Center (ISAC), Bangalore, senior scientist TK Anuradha, project director for the GSAT family of satellites, said: "ISRO is experimenting on docking, and there's a lot of work going on in this space. She did not, however, elaborate further. "At present, some ground simulations are happening at ISAC. Favorable results will see us trying this with two small spacecraft launched for the purpose," another senior scientist said. "It can be used for orbit servicing of satellites, for example, as we operate a huge constellation of them," the scientist said. One major advantage such a technology will give ISRO is the ability to enhance lives of satellites by refueling them. Imagine a project like Astrosat, with high-end technology as part of its payload that has many years of life. The mission will end once the fuel is over. But With the docking technology, ISRO could keep refueling the space observatory. "This will also help reduce space debris," the scientist added. 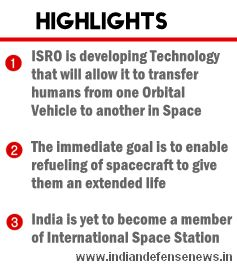 India is yet to become a member of the international space station or have a human space programme in its immediate plan.